Effective militaries design institutions that maximize innovation while minimizing inter-service rivalry. A recent piece at Medium by David Axe highlighted (in addition to including some remarkable pictures of wave-riding B-52s) the USAF’s efforts to make the BUFF again relevant for maritime affairs. During the Cold War, a portion of the B-52 fleet was modified to carry anti-ship cruise missiles for operations against the Soviet Navy. As part of the Pacific Pivot, as well as Air Sea Battle, modifications to the B-52 are again making it a potentially potent maritime weapon. While the decision to arm B-52s for a maritime role may seem utterly sensible, the use of strategic bombers in maritime roles has long been a sore spot for Navy-Air Force relations. Since before World War II, tensions between the USN and the various iterations of Army aviation burst forth regularly, most memorably with the destruction of the old German battleship Ostfriesland by Army bombers in 1921, and the cancellation of the prototype supercarrier USS United States in 1949. Organizational infighting over naval aviation is common, and can have serious negative effects. The Luftwaffe, optimized for tactical and operational support of the Wehrmacht, never worked very well with the German Kriegsmarine, leaving the submarine and surface fleets with a limited picture of the battlespace. The most famous organizational catastrophe to afflict naval aviation happened in the United Kingdom during the inter-war period. As a result of the brutal bureaucratic infighting between the Royal Navy and the infant Royal Air Force, responsibility for naval aviation fell to the RAF, which had little interest in carrier aircraft. As a result, training, doctrine, and procurement suffered, leaving the Royal Navy’s carrier force ill-prepared for the challenges of World War II, although during the war the relationship between the RAF’s Coastal Command and the Royal Navy became a model for inter-service cooperation. The seams between military organizations are always problematic, even if some partners work successfully to resolve or ameliorate those problems. AirSea Battle is, of course, a strategy to pre-emptively manage some of those problems. Different states seek different solutions; the Soviet Navy, for example, avoided Navy-Air Force tension by operating several strategic bomber types dedicated to maritime warfare, including most notably the Tu-95 variants optimized for reconnaissance, surface warfare, and anti-submarine warfare. China’s efforts to resolve these organizational tensions are particularly interesting. At stake are issues of training, preparedness, and procurement. At least three different elements of the PLA share responsibility for the maritime airspace, including the PLA Air Force (PLAAF), the PLA Navy (PLAN), and the Second Artillery. As of yet, there isn’t any evidence of serious tension between the PLAN and the PLAAF over missions, aircraft, but it would be very surprising indeed to find that organizational problems were entirely absent. It probably helps that the PLA acts as an overarching institutional framework, mediating relations between the organizations themselves, and buffering them from contact with civilians. 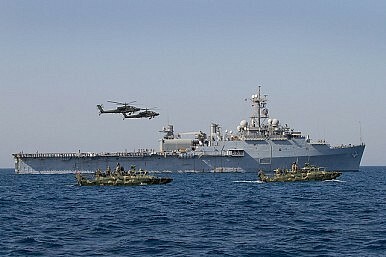 Nevertheless, it remains unclear how the services will resolve issues associated with strike, fleet air defense, and anti-submarine warfare in the event of actual conflict, as it is likely that the organizations prioritize these missions differently. At the same time, the success of the Second Artillery in developing a conventional mission for itself (including various forms of land and sea attack cruise missiles, short-range conventionally armed ballistic missiles, and of course anti-ship ballistic missiles), speaks to one of the greatest strengths of an organizationally diversified military; the incentive that each branch has to maximize its contribution to the war effort and, consequently, its claim on resources. Designing a set of military institutions in order to maximize that kind of innovation while minimizing vicious bureaucratic turf battles is perhaps the most challenging aspect of maintaining a modern, combined arms military establishment. Long subordinate to the army, the PLAAF is gaining greater autonomy while still cooperating admirably with other services.